It's about midnight in Los Altos, California so no long essay from me today ... maybe just a story. In the afternoon my wife returned with notarized papers that had to be postmarked Dec 31, 2011. The mailman arrived at the same time (he was early). By the time I put the package together he was at the last house. I almost missed the mail as I didn't "know when things happen." Reaching home, my son asked if he could drive the car down the street and park. As we drove in reverse to park, I advised "look where you are going." What's this have to do with US patent law? The America Invents Act (AIA) has changed patent law in major ways. Things won't work like they did in the past. We will need to "look where we are going." And because of its staggered implementation, it will be critical to "know when things happen." Many more sections of the AIA will be enacted in 2012 and the proposed PTO implementing rules are expected to be published within a month. Many are writing about the AIA, but it is important to read the statute. Professor Dennis Crouch's markup of US patent law shows what has changed and when the changes take effect. Some parts of the AIA are vague, but I expect the Patently-O blog and the PTO's web page Leahy-Smith America Invents Act Implementation and others such as Harold Wegner will keep us abreast as the courts and PTO interprets its provisions in the future. We shouldn't be worried about the changes. As Donald Chisum notes, amidst the hype, the American Invents Act leaves most of the important topics of US patent law unchanged. See Chisum's What the Reform Act Does NOT Reform. As Chisum states, "Never has so much attention been focused on a patent enactment that accomplished so little." And Chisum on Patents is considered the essential patent law treatise since 1978. Finally, thank you for reading the Patent Planet blog in 2011. I am delighted to have readers in United States, Russia, Germany, France, Italy, India, China, Malaysia, Japan, Canada, Romania, Egypt, Sweden, Vietnam, Macedonia, and Thailand. Note I updated the article as late as January 3, 2012. Copyright © 2011-2012 Robert Moll. All rights reserved. Marking has become an important issue in cases like the Oracle v. Google patent suit. Search on "marking" in the Groklaw articles. The issue boils down to this: If a patent owner or its licensee fails to mark its products, damages cannot be recovered for infringement occurring before actual notice (i.e., a specific charge of the infringement or filing a patent infringement complaint). 35 USC 287 suggests marking is simple. Fix the word "patent" or "pat." together with the patent number on the product, or if this cannot be done on the product packaging. Analyst and blogger Florian Mueller notes how difficult it has been for patent owners in the ITC in recent times. The details are described here: The ITC is tough terrain for mobile patent plaintiffs. 1. Software may be viewed as incapable of being marked. Stating software is a intangible set of instructions and not patentable per se obscures that software is often contained in specific device or installed in a general purpose computer on storage media (e.g., DVD, CD, or solid state device). If the patent has device or computer-readable medium claims, it should suffice to mark "substantially consistently and consistently" on the device, media, or if necessary, the associated packaging. Another approach is to virtual mark the device or storage media as permitted under the America Invents Act (AIA). Virtual marking is a mark (e.g., URL) that directs the public to a freely-accessible Internet address where a patented product is associated with its patent number to give notice that a product is patented. This should become the preferred way to mark in the future. 2. The PTO is so backlogged that US patent issue and the ability to mark happens well after product is released. Apple's whopping (yes 358 pages) iPhone patent issued in 2009, which was well after the iPhone release in 2007. Apple sold tens of millions of iPhones with no related patent markings because it sold the iPhones before this patent issued. I don't see this problem going away. Despite progress under Director Kappos, the PTO continues to have lengthy pendencies (the PTO Visualization Center says pendency is 34 months) and the PTO art units that examine software inventions are even more backlogged. Plus current law permits a one year grace period to file a US patent application after the first offer for sale or public use of the invention so companies may choose to patent after product release today. 3. Some have concerns of the risk of false marking. This is understandable since US law gave anyone standing to sue a patent owner for false marking for a fine of up to $500 for every offense. Then the Federal Circuit in its wisdom held an "offense" relates to each article that has been falsely-marked. Thus, a fine for 10,000 software programs falsely marked could rise to $5,000,000. No wonder a cottage industry (opportunistic patent attorneys) arose to sue any patent owner with a large number of improperly marked products. Never mind some products simply bore expired patents, the plaintiffs were too busy working in the "public" interest. Fortunately, the risk of false marking is reduced because the AIA requires only one who has suffered a competitive injury has the right to sue. 4. The value of the software patent may be found in method claims, and a method cannot be marked like a patented article. Decades of law say 35 USC 287 does not impose a duty to mark on the owner of a method patent or even on a patent owner who is not manufacturing a patented product. Although virtual marking doesn't expressly resolve the problem of how to mark a method, it seems it should be extended by amendment to methods since the argument that a method patent cannot be marked is no longer accurate given the ease of marking on the Web. Caveat 1 Virtual marking appears to require free access. Presenting patent marking on a client computer to a paying user, does not appear to satisfy the freely-accessible Internet requirement of 35 USC 287. Thus, it may be best to present the information on a web site, which is freely accessible to the public as well. Caveat 2 If a company has lots of products and lots of patents, listing all of the patents on a company web site without stating how they relate to the products may not satisfy the requirement to "mark" the product. RIM's effort to virtually mark before the AIA probably failed in two ways: (1) listing thousands of patents on a web site provided no notice which product contains certain patented inventions, and (2) listing thousands of patent raised the concern of false marking or suggested to the layperson that all or some unspecified large subset of the patents were related to the products. Caveat 3 Software upgrades and patches may "remove" the patented invention from the application and raise the spectre of false marking. So like most of the stuff in life you can't just set it up and walk away. You need a team who understands the software and monitors the company software products to remove a patent from the list that is no longer pertinent to a given product in a timely manner. Caveat 4 It is unclear whether presenting patent numbers at the client computer of a distributed system will suffice for marking for an invention that resides on the server side. On the other hand, since only an administrator routinely may view server-side software, perhaps you display the patent and number at the client, but state the invention is on the server. In the future, virtual marking should be the preferred way to mark since it provides a flexible and efficient way to notify the public of the existence of a patent. Virtual marking should also open the door for more patent owners to avoid false marking charges and obtain more than a reasonable royalty for patent infringement occurring prior to actual notice. Soverain Software LLC v. Amazon.com, Inc.
A US patent only protects the invention in the US and will not stop infringement abroad. Thus, a foreign patent is required in each country where patent protection is desired. However, it is expensive to file applications in all countries where the invention may be infringed. I want to discuss some ways of protecting the invention abroad without wasting money. Companies and startups in particular should not feel compelled to foreign file everywhere. It may be better for a company with a constrained patent budget to focus where it has current and expects future sales. Manufacturing a patented invention without permission may serve as a basis for infringement, but competitors may readily change a manufacturing site. It's much more difficult to change where the invention is sold or used. For example, a startup having US sales of 40%, European sales of 20%, China sales of 15%, Russian sales of 10%, and 15% in the rest of the world may decide to seek patents in the US, Europe, China, and Russia, and ignore the rest. This "patent where you have sales" should be tempered by an assessment of the commercial value of the invention. The more important the invention is to a company, the more far reaching should be the patent effort, and vice-versa. Although far from a comprehensive study, my review of several Fortune 100 companies revealed even those with great financial resources were selective on foreign filing. Thus, a company might file only one application in the EPO for every five times it filed in the US. I think that people are starting to analyze the cost of EP filings correctly over the long term. The EPO likes to stress the European countries can be processed as a single application in the European Patent Office, but you must look at the total cost of the entire process including after an EP patent issues. The cost reduction of that single application ends after the application is accepted as patentable. At that stage one must engage a foreign associate to pay the grant fee, file a translation, handle formalities, and pay fees sometimes annually in each country designated in the application. The entire cost can be substantial, e.g., $80,000, to cover major EP countries from the filing date to end of the patent term. The other point is the costs of foreign filing have a wide range. For example, each filing in Canada, China, Hong Kong, Singapore, or Taiwan may be $3,000-$4,000, while filing a single application in Europe, Japan, or South Korea may be $6,000 - $8,000. These are ball park figures to illustrate relative costs. For actual costs I suggest one contact a foreign associate in the country of interest close to the foreign filing date. One more thing, although one can file directly in each foreign country, it may be less expensive to first file a PCT application designating all foreign countries of interest for about $4,000, which permits you to extend the 12-month foreign filing deadline and attendant filing expenses another 18 months until a company can better assess the commercial value of the technology. It typically saves money by giving a larger window to determine if the foreign applications are worth it. Finally, any disclosure of the invention that occurs before the US filing date may bar foreign patent protection depending on the facts, which should be considered carefully with foreign counsel at the outset. The United States Patent and Trademark Office (PTO) announced yesterday the deadline for filing petitions under the Green Technology Pilot Program is being extended through March 30, 2012 or until 3,500 applications have been accorded that status. Participants in the Green Technology Pilot Program have obtained patents much more quickly than applications undergoing standard examination. For example, the average time between granting of a green technology petition and first office action on the merits is just 78 days. And in many cases, applicants have had their green tech invention patented in less than one year. The program is still relative small because just more than 2,900 petitions have been granted to green tech patent applicants since the program began in December 2009. See the PTO release here for details. Patenting is too expensive unless an invention has real commercial value. Of course, the marketplace will tell us where there is commercial value, but the law often prevents us from hearing it before we must decide whether to file. For example, currently you must file a US patent application within one year from your first offer for sale or public use of the invention or you are barred from getting a valid patent. It appears likely the American Invents Act will not provide a grace period for a pre-filing offer for sale or public use if the US patent application has an effective filing date on or after March 16, 2013. Foreign patenting typical provides no grace period for commercialization before you file. Given the information gap, how can you know what to protect and what to let go? There are a number of factors, but I suggest you consider the generality of the invention. After all, if the invention is too specific in how it solves a problem, competitors can provide another solution without infringing the patent. You also should consider who has this problem, and the likely time frame of the problem. if trapped in a corner grabbing a rope anchored to the ceiling to traverse from the trapped corner to the exit door. Gee, you say, I wouldn't have thought of that-- does that make the invention non-obvious? Maybe, but who would want to use this? ... Tarzan. Yes, he would want to do this at the end of each job. How about the scope of the patent? It has the Tarzans of the world on the "ropes." painting the floor so unpainted floor is maintained as a path for the painter to an exit door. This invention is general in its terms because it solves a problem that many will need to solve for the forseeable future. Forget my examples, they are silly, but don't forget the principle-- generality. It can speak before the marketplace can clear its voice. You Have to Pay for that Banana! Last week we reviewed how lack of early patenting left the door open for Microsoft to grab Netscape's bananas. Now let's look at a story where a much smaller chimp was able to make the Gorilla pay for it. This story goes way back to when the MS-DOS operating system was the dominant platform for PCs and hard disk drive storage space was at a premium. Software developers were developing data compression software to increase the effective size of the hard disk drive. The leader in data compression for DOS operating systems was a small software company based in Carlsbad, California, Stac Electronics (Stac). Although Microsoft dominated everybody in its sales of the MS-DOS operating system primarily through its sales to OEMs, it had not developed its own data compression technology for MS-DOS. In contrast, the Novell DR-DOS operating system had it. In 1991 Microsoft requested Stac grant a world wide license of its data compression technology for its future MS-DOS operating systems. According to Stac's complaint, Microsoft took the position that it did not have to pay a royalty for the license. Microsoft instead suggested that failure to reach an agreement just meant Microsoft would go to another developer, which would have a definite impact on Stac's sales. Negotiation broke off in June 1992. Shortly afterward, the industry became aware that Microsoft intended to release the MS-DOS 6.0 operating system, including a data compression utility called DoubleSpace, sometime in the first six months of 1993. Stac then resumed effort to reach an agreement in November 1992, but was again unsuccessful. However, Microsoft agreed to send a beta copy in January 1993. When Microsoft released the beta copy it attempted to reassure Stac in writing: "Don't worry about the patent stuff. We are just going to keep with our changed code which does not infringe." After review of the beta copy, Stac somehow reached a different conclusion and sued Microsoft for patent infringement, copyright infringement, and trade secret misappropriation. The court ruled Microsoft had not infringed the copyright nor misappropriated any trade secret, but had infringed the patent(s) and awarded Stac a permanent injunction against future patent infringement and $120M in damages. After about a week of shipping the MS-DOS operating system without the data compression, Microsoft negotiated a settlement reportedly worth $83M to Stac for the right to license, for a royalty, any of Stac's existing or future technology including that unrelated to data compression and Stac received a license to some of Microsoft's technology. The decision was not precedential, but is worth remembering. In The Gorilla Game, Geoffrey Moore stated successful high-tech investors must identify and invest in the companies that would catapult to "gorilla" status, dominating their market. He discusses many factors that lead to gorilla status, but not so much about patents. That book seems a little dated for that reason. Today, tech companies believe patents play a major role in getting or protecting market share. Thus, we have Apple and others' patent infringement suits around the globe, and Apple and Microsoft's $4.5B purchase of the Nortel patents and Google's $12.5B purchase of Motorola Mobility, etc. What can be learned from the browser wars that might apply to the mobile computing today? 1. Owning an unpatented market share of something valuable is vulnerable. Netscape gained dominant market share, but the basic technology was in the public domain. 2. Big money will attract gorillas. If you're close to a gorilla, the basic technology must be protected with patents. If it cannot, expect to lose market share (some or all) to the gorilla, i.e., the bananas will be grabbed. 3. As long as the basic technology is unpatented, market share can shift rapidly. Netscape's gorilla-like market share disappeared rapidly, that is, basically faster than Netscape could adjust. 4. If no one has patented the basic technology or control of the basic patents is distributed among companies, it is difficult to envision the market share shifting based on patents. Eventually the companies must license each other's patents and the market divides up. 5. Identitying and patenting basic technology is crucial. If you cannot, you should identify a niche that will not attract a foraging gorilla. This patent committee appears to be in a hurry to file lots of applications without a patentability search. Why would they do this? I don't know all the reasons, but searching can be difficult and tedious. Some may seek to avoid this work. Others argue it saves money to not search. Others may want to avoid delay in filing. Others maintain it's the examiner's job and only the examiner's search counts. Hate to notice it, but some attorneys may prepare patent applications without a search because it is more profitable. Why eliminate "half your expensive filings" with not so expensive patentability searches? Whatever the reasons, it appears until it is legally required some won't search. However, many benefits arise from a patentability search before an patent application is prepared and filed. The search could filter out the invention that is not patentable. By identifying this fact at an early stage applicants would also save the cost of preparing, prosecuting, and maintaining a patent, which cannot be enforced in court. Judges don't like to eat a "rotten egg" and "cooking" it will not change that fact. Second, let's assume the invention has some novel features but they are not clearly identified before preparing the patent application. The attorney will give equal treatment to all the details, which may short shrift what is truly innovative. The attorney will be also forced to provide a longer and more expensive application in an attempt to maximize protection on what is later found patentable. Further, whatever is described in the application that cannot be protected with claims is considered to be dedicated to the public. This means more information goes out about your company's technology with no real protection. A thorough patentability search can also increase the probability that a patent will be found valid in litigation. In the past, annual data prepared by the US Patent and Trademark Office demonstrated that 75% of patents are held valid at trial when the closest prior art was considered earlier by the Examiner. If the litigants however find the closest prior art during the trial, the number of patents upheld as valid drops to below 50%. Moreover, the battlefield has shifted in many ways from how to prepare valid patents to how to prepare patents which are literally infringed. Since Pennwalt in 1987 it is difficult to establish patent infringement under the doctrine of equivalents especially when facts of prosecution history estoppel exist. If you do find prior art that is closer than that found in the Examiner's search, you may avoid a prior art rejection that requires amending or canceling one or more claims. This helps to avoid prosecution history estoppel, where the claims must be narrowed or canceled to avoid reading on the prior art. The pre-filing search can also streamline prosecution by assisting the examiner, lengthen the patent term, and identify equivalents for disclosure in the specification to support literal infringement of a means plus function clause. The equivalents can be used to help support broad claims that might be held invalid if based on only a single example. The pre-filing search increases the chance of collecting a reasonable royalty for infringement of any patent claim that is substantially identical to a claim in the published patent application for the same reasons discussed under prosecution history estoppel. It would reduce the PTO's backlog if applicants searched and honestly assessed if the invention is new and non-obvious over the prior art. In addition, the pre-filing search protects the integrity of the patent system and the public interest by ensuring that the most relevant information is before the examiner during examination. Due to the Internet, it is always cost effective to search using keywords and/or classification of the prior art in the US. If one wants to spend more, the search can be extended into other major patent countries or regions such as the Europe, and Japan as well as PCT applications. What is the prior art we are searching for? Prior art has an intricate definition, but can be viewed as technology in the same field as the invention or reasonably pertinent to the problem addressed by the invention. When does this technology qualify as prior art? Under current law, its technology prior to the date of invention. Under the America Invents Act, its technology (short of inventor disclosures) prior to the filing date of an application that cannot claim an effective filing date before March 16, 2013. Searching should be the default, if not legal requirement, for all applicants. We are not in the job of getting a patent, but an effective patent that promotes the progress of the useful arts (technology). Although the examiner will conduct a patentability search, two searches are better than one, and all applicants have strong incentives to do a patentability search. Your Patent Application Was Allowed . . . Now What? The PTO can be a "black box" at certain stages and after allowance is no exception. Patent owners are confronted by cryptic, mystifying notifications filled with more acronyms than a military base. The time period between allowance and applications is a happy time for patent applicants, but no less confusing. When the examiner allows a file it is sent to the Office of Patent Publication Allowed Files area. The application is then forwarded to Initial Data Capture (IDC) for electronic capture of the patent file. It takes approximately 6 weeks from the date that the allowed file is received for the completion of the Initial Data Capture of the application. The application is then sent to the File Maintenance Facility (FMF) for matching of the issue fee and any other correspondence. The application may stay in the FMF for approximately 1-2 weeks. However, if all requirements are not yet fulfilled the application will remain at the FMF until the requirements are met. Once the fee and any correspondence and/or drawings are matched with the application and all requirements have been met for issuance as a patent, the application is then forwarded to the Final Data Capture (FDC) stage of the process. The FDC makes any updates necessary to the electronic file and places the allowed patent application in an issue. The average time that an allowed application is in the FDC process is 5 weeks. The “Issue Notification” is mailed approximately 3 weeks prior to the issue date of the patent. 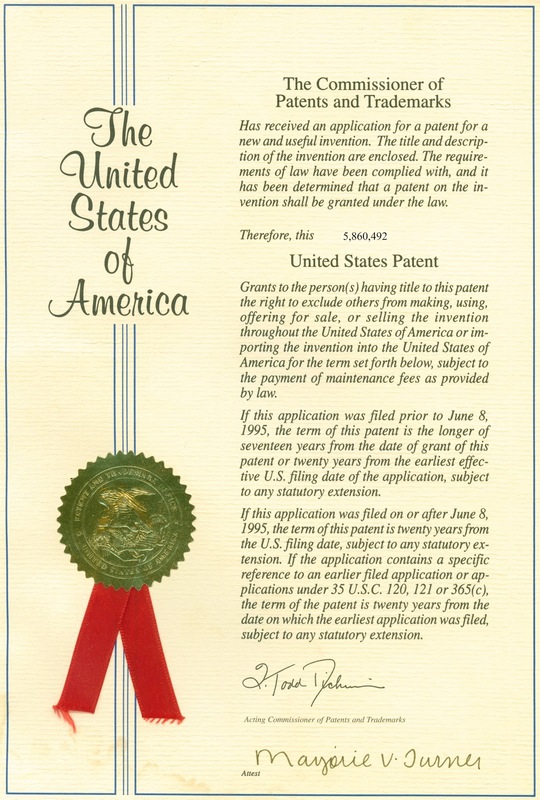 The patent grant is mailed on the issue date of the patent. It includes any references to prior patents, the inventor(s)') names, specification, and claims (to name a few). It is bound in an attractive cover and includes a gold seal and red ribbon on the cover. Note these are PTO estimated times. I have seen patents issue much faster. For example, one recently allowed application is scheduled to issue as a patent less than seven weeks after we paid the issue fee.